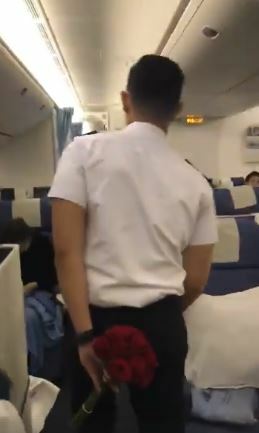 I saw a viral video the other day about a touching homecoming which happened on an airplane. Juan Paolo Fermin hasn’t spent Christmas with his family in 17 years. Juan Paolo’s mother—like many Filipino parents—had to leave for abroad when he was 8 years old. Though they would see each other occasionally since then, almost two decades would pass before they could spend Christmas together. When Juan Paolo found out that his parents would be flying home from Canada via his employer Philippine Airlines, he exchanged schedules with a colleague and surprised his mother and stepfather before take-off. The video shows him walking excitedly towards his mother, with a bouquet of flowers in hand. When the mother saw her son, they shared an emotional embrace, and the mom just kept on repeating, “Anak ko, anak ko.” I could just imagine where they are right now. Maybe they are at mass, like you, thanking the Lord for the gift of family and the great grace of coming home. In our Gospel tonight, the holy family, too, comes home. A census was ordered by Caesar Augustus and so Mary and Joseph had to travel from Nazareth—where they stayed and where Jesus would eventually grow up—to Joseph’s hometown of Bethlehem to be enrolled. Nothing is said about their journey, but it must have been long and hard—perhaps similar to ours–minus the delayed flights or bumper-to-bumper traffic. It must have been particularly difficult for Mary who was very, very pregnant with Jesus. It must have been long and hard, but for Joseph and Mary, it must have been also very exciting, nostalgic, even hopeful. Not only were they coming home, they were coming home as family. And that’s something we could all very much relate with, we Filipinos who value family above all. Many of us see Christmas as truly the most wonderful time of the year simply because we can come home, and come home as family. But there are times, we must admit, that coming home is not always as pleasant. Sometimes things just don’t work out quite as planned. And I’m not just talking about Noche Buena not being as delicious and filling as expected. I’m referring to those moments when, instead of being marked by joy and celebration, our coming home for Christmas is rather lonely, difficult, and even empty. For example, how many among us will be celebrating Christmas without a loved one who cannot make it home? Or who has passed away recently? Who among us are spending Christmas with family, and yet cannot celebrate fully because of an unresolved conflict with a relative, a silent cold war with a sibling, or a lingering grudge for someone close who has hurt us? Sometimes coming home is not at all that pleasant and it is tempting to think that Christmas has lost its meaning because of that. Well, it hasn’t. Because the First Christmas wasn’t that perfect at all. Joseph and Mary, after a long and difficult journey, came home to Bethlehem and yet, there was no grand homecoming. In fact there was no one to welcome them. In fact, there was no room for them in the inn. They settled in a lowly manger where Christ the child, in swaddling clothes, was born. If there is anything grand to the first Christmas it would be the heavenly host with the angel proclaiming the good news of the birth. But their audience was not a church full of people like what we have tonight, but shepherds—simple shepherds who happened to be in the area watching over their flock. I wouldn’t go as far to say that Mary and Joseph’s homecoming was depressing or tragic. But it was far from perfect, far from the grand and elaborate way we often insist our Christmases must be. The First Christmas–the most famous homecoming in history–was marked not by acceptance, hospitability, or great rejoicing, but rejection, some coldness perhaps, and a quietness so ordinary that it seemed almost inappropriate for a homecoming, much less the homecoming of our King. Yet our celebration tonight–and your celebration later tonight and tomorrow and the days to come–are founded on this simple and far-from-perfect homecoming where our King was not even given a room to stay. This is what we celebrate: how the Christ of Christmas was born into our imperfect world in the most imperfect of ways so that he could be with us and love us, imperfect as we are. Dear friends, we do have to celebrate and celebrate well, for family is home, and we are home. More importantly, God has chosen to call home this world of ours so that we could live in His heavenly home as well. Yet let us not forget the simplicity, the quietness, and the imperfect way that God has come into our home. It is precisely in its being imperfect, irony of ironies, that we see how perfect that First Christmas was.